Register Log In GliderCENTRAL Forums Glider Talk and Traveling OMG! They stink! My late Tucker was a odoriferous chap, his son TJ doesn't stink. But boy do his grand sons and great grandsons stink. They smell just like their late grand dad and there is 3 of them in the house right now. Pffffwwwwwweeeee! At least we took care of one today, not using the N word here but he got N'ed. He will be going to a new home soon. Plus his stinky testosterone levels will go down. Hopefully once the other two boys are separated and in a cage with their women they won't be trying to out stink each other. Remember when we were kids and we said boys stink. Well we were right! Is it because there are so many boys? Are they trying to see who stinks the best? Yes, there are three in that cage and they are having a stinking contest. Although the one got the little N, he will still stink till the testosterone level goes down. Plus now Mary is here for the weekend so that makes 6 intact males and one still stinky till the testosterone gets out of his system. Speaking of smelly: Mine have been sticking up their cage quite a bit lately. Particularly when I've had a bunch of people over (sometimes with their pets). While you might say "Duh, Hutch," keep in mind the visitor situation is not a new occurrence; they've always dealt with that two to three times a month. I can really tell different when we're sitting at my table (cage is in the same area) and suddenly the smell will become noticeably worse. Not just to me, but to my guests too. It's usually when I can hear them moving around at odd times (for them), too. Luckily, with the windows open, the smell fades quickly enough. I just wonder why now they feel they must re-dedicate their territory whereas before they would just go back to sleep if disturbed. Speaking of smelly: Mine have been sticking up their cage quite a bit lately. Particularly when I've had a bunch of people over (sometimes with their pets). I just wonder why now they feel they must re-dedicate their territory whereas before they would just go back to sleep if disturbed. I would say it would be because of the other animals in the house. When I first moved into this apartment the previous tenant had cats and that was all I could smell. 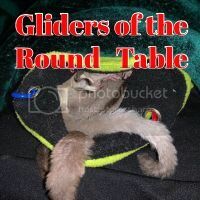 It was especially bad in the room that the gliders now reside in, boy did those intact males go to town in that room. Oh boy who lost their manhood. He got his first nail trim today. Here are some pictures. A month ago, I would have named him Ruckus. He was quite verbal at OSGA. But I'm sure he has calmed down by now. Last edited by Ladymagyver; 05/29/17 03:11 AM. Omg I love the second picture he like what are you doing to my tail human lol. Oh wow! I didn't even see the pictures, what a handsome fellow!!! These guys were the wee ones at the OSGA. The ones that were crabby were the two older boys.